American Express is starting the year off right with their Air Miles portfolio of cards! They have released new sign up offers on the Air Miles Reserve Card and the Air Miles Platinum Credit Card. The Platinum offer is the biggest offer yet seen for this card and the best thing about it is that it is first year free which means you essentially get those 2,000 Air Miles for free! You do have to complete the minimum spend of $500 which for most of you shouldn't be an issue. I'm normally not one to carry a Air Miles co-branded credit card but am tempted by this offer especially since my Air Miles balance has been growing rapidly due to the fact that my local shopping area had 2 of 3 stores switch from Aeroplan to Air Miles. How about you? Is this 2,000 Air Miles with no annual fee in the first year tempting enough to have you get the card? 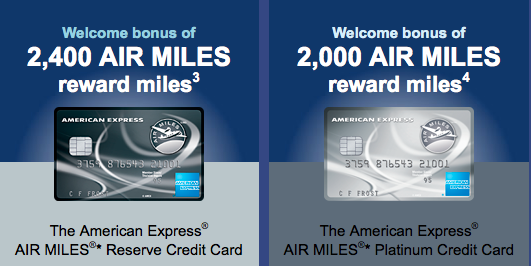 The other increased offer is for the Air Miles Reserve card which sees its bonus increased to 2,400 miles. Not the highest we've seen for the card but nothing to laugh at either if this card suits you! • Receive four complimentary visits per year to Priority Pass Worldwide Lounges and access to the Toronto Pearson Priority Security Lane and Toronto Pearson Priority Limo and Taxi Lanes.